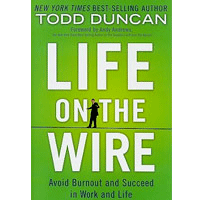 In Life on the Wire, New Your Times best selling author Todd Duncan challenges the status quo in search of a better, smarter way to work and live. He profiles several people striking out to find "balance." You'll meet an entrepreneur, a bartender, and an accountant, among others. You'll hear their stories, their challenges, their insights, and the critical lessons they learned. Duncan contends the last thing we need amid life's inherent imbalance is another attempt at a how-to formula for perfect balance - equal parts work and life. In fact, he argues that such a holy grail does not exist. Instead, he has issued a more pragmatic formula he calls purposeful imbalance: the process of purposefully leaning toward work without sacrificing life and purposefully leaning towards life with damaging your career. It is precisely the way a tight-rope walker makes his way across a one-inch rope without falling.